Google’s open source mobile phone OS Android is now the first choice for OS of popular smartphones. Apple’s iOS is for iPhones, iPod and iPad and no other company can use the same. That’s why companies are tweaking Android and creating good-looking interface for their smartphones. Android and iPhone war is similar to Apple and Microsoft war and this time Google is looking forward to repeat the same by letting more and more companies pick Android. Motorola, HTC, Dell, Samsung and many more companies are using Android in their mobile phones. 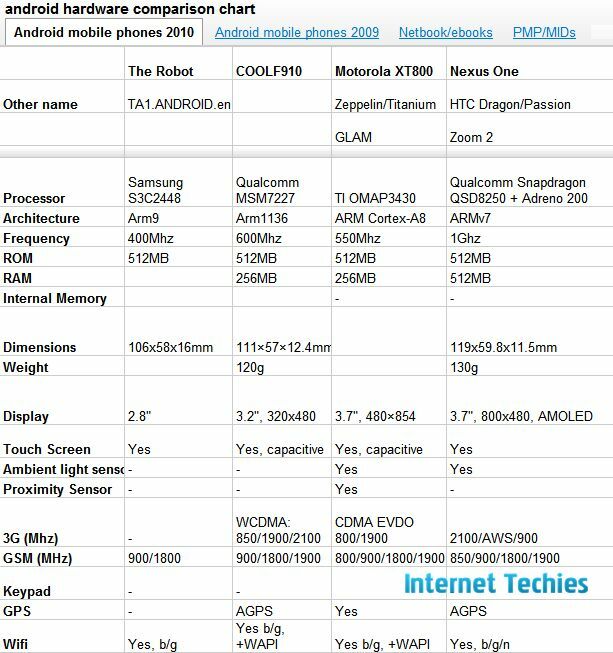 If you are looking forward to purchase Android based smartphone in near future, then here is a well maintained comparison chart showing technical specification of smartphones running on Android OS. Here is a snapshot of comparison chart, you can view the spreadsheet by clicking on the link below this image. Popular smartphones covered in this chart are Nexus One, Motorola Droid, HTC Legend, Samsung Galaxy S, Galaxy A, Motorola Milestone, HTC EVO 4G, Sony Ericsson X8, Samsung Epic 4G and many more. Out of these Android based mobile phones, which is your favorite one and why? Thanks to hdmp4 for creating and maintaining this awesome comparison chart for Android Phones.